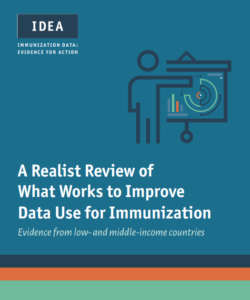 A new report from the Pan American Health Organization (PAHO) and PATH, Immunization Data: Evidence for Action (IDEA), has launched to provide the immunization community with clear, proven strategies for improving the quality and use of immunization data. While advances in information technology have led to continuous increases in the amount of health data available, data remains an underutilized resource in the design and implementation of immunization programs throughout the world. The IDEA review identifies five proven strategies to improve data use and outlines how funders, policymakers, and program implementers can incorporate these best practices to improve the efficacy of state, regional, and national immunization programs. April 15, 2019	 | Jonathan F. Mosser, William Gagne-Maynard, Puja C Rao, Aaron Osgood-Zimmerman, Nancy Fullman, et al.